This article was originally published at showwatcher.com on May 16, 2012. Television has had a long history of taking hit motion pictures and adapting them as television series. Occasionally the TV shows are better than the movies they are based on or have more of an impact on the public consciousness. While many comedies and dramas have successfully made the transition from the big to small screen, here are five science fiction movies that made very good television (sorry, Buffy the Vampire Slayer fans, that’s fantasy/horror, not science fiction). Before Roland Emmerich began destroying the world, he made the cool science fiction adventure Stargate, about a military team and a nerdy cartographer/linguist travel through some mysterious gate dug up in Egypt and find themselves on another planet fighting an ancient god that is really an alien. While the movie was a fun escapist diversion, the most memorable thing about it was the potential it had. It was a great concept that ultimately turned into a rally-around-the-flag battle with spaceships and explosions. It only made sense that this story be continued and explored more in depth as a TV series. Stargate SG-1 recast the roles and retooled them a bit (Colonel Jack O’Neill was no longer so suicidally sulky), arguably an improvement over the film. Fans responded to the show, which lasted a whopping ten seasons, first on Showtime and then on Sci-Fi Channel. It spawned two live action spin-offs, an animated sequel, and a couple of direct-to-video movies. Second only to Star Trek, this series has made more impact on science fiction television than any other by telling intricate story arcs in a complex universe. It’s common for movies in a series to ignore previous installments, but Terminator: The Sarah Connor Chronicles is possibly the only TV series based on movies to selectively continue the story from one film but ignore its sequel. In this case, the TV show is a direct sequel to Terminator 2: Judgement Day, but pretends that Terminator 3: Rise of the Machines never existed. It picks up a few years after T2 with Sarah and her teenaged son John (AKA the future leader of the human resistance against the machines that want to wipe out all humanity) in hiding and once again being tracked by a time-traveling robot. Through plot contrivances, they access the same time-displacement device that has made this entire story possible and go forward in time, thereby placing them in 2009 and avoiding either a continuity problem of changing the time period of the movies or being saddled with having to make a period piece. 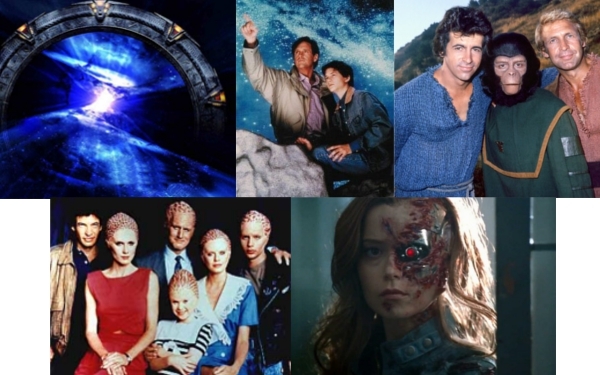 This show was filled with terrific action and special effects, great acting (Lena Headey almost made us forget about Linda Hamilton, and Brian Austin Green was surprisingly effective as John’s uncle Derek Reese), and a serialized storyline that both honored James Cameron‘s films and expanded this universe into a thrilling and compelling production that had a life of its own. Unfortunately, it only lasted two seasons and concluded with a twist that acted as either a huge cliffhanger or an indication that the previous plot had been resolved and left us to imagine how John’s situation would eventually lead him to become the rebel fighter in the future war. As with Stargate, the film Alien Nation had a great concept that wasn’t executed as well as the creators wanted. In fact, the title was supposed to state the theme (alienation), but a typo wiped that out by separating it into two words. Like the critically-hailed District 9, the story picked up years after an alien space craft crashed on Earth, leaving its inhabitants as unwelcome guests on our planet, though instead of CGI insects, we were given humans with prosthetics on their heads who integrated into our society as second-class citizens. The main characters were a pair of human/alien cops played by James Caan and Mandy Patinkin solving a crime, so the themes of one race being subjugated by another was overshadowed by a standard police procedural with a duo of contrasting buddies much like what was satirized in The Last Action Hero. The TV series took this concept and developed the themes of racism and other social issues, led by series creator Kenneth Johnson, who did similar things with The Incredible Hulk and V. Gary Graham and Eric Pierpoint made the characters more relate-able with light banter and a true friendship that grew between the characters. In addition to the social commentary, the lives and culture of the Newcomers are explored to a greater extent than the movie was able to do. FOX cancelled the show after one season (at least they gave Sarah Connor slightly more air time), but produced five follow-up TV movies. The guy from Airplane! taking over the role that earned Jeff Bridges an Academy Award nomination? How much wronger can a TV adaptation go? Actually, the television series Starman got a lot of things right. Instead of being a remake like most series based on movies, it was a direct sequel to the John Carpenter film that told the story of an alien stranded on Earth who takes the form of a dead man and teams with his widow to get back to his people; in the course of the film, the two fall in love despite being of different species. The series picks up 15 years later (getting trapped in the paradox that Sarah Connor avoided by having to shift the time frame of the movie from 1984 to 1971, creating more continuity problems) with Starman returning to Earth and assuming the form of a recently-killed photographer played by Robert Hays. His beloved Jenny (why are the loves of protagonists always named Jenny?) is missing and her teenage son (Christopher Daniel Barnes) is in foster care. Starman and his son go on the road searching for Jenny, staying one step ahead of a government agent. Despite sounding like an alien version of The Incredible Hulk, this show found its own voice, mostly in the touching father-son relationship as the boy teaches his father what it means to be human while learning of his own alien powers. The show ran for one season, and the producers had enough foresight to see that cancellation was imminent, so they provided a two-part resolution to their journey (oddly followed by one more episode) when they finally find Jenny. There are some nice flashbacks to the movie, though remade with Erin Gray, who took over the role from Karen Allen. Great write-up! I loved Sarah Conner Chronicles so it’s a shame that never found it’s audience. I wish HBO would take chances on ideas like that, it would be the perfect tie-in for the network. Thank you. Yeah, an HBO Terminator show would definitely be grittier than one on Fox, where the tone of the movies could remain intact, especially with the violence. Also, cable shows tend to have fewer episodes, which allow the writers to avoid filler and make every story count. Exactly. While budgets, effects, violence, etc. are all huge bonuses, the best thing to come out of premium network would be streamlining the episodes as much as possible. In fact, a show like SCC would have almost worked best in the BBC Sherlock format of 3 episodes that are about 90 minutes long. I would want more than just 3 episodes (my only gripe with sherlock), but definitely streamlining shows like Games of Thrones or The Walking Dead puts a lot of punch in each episode. I quite enjoyed Sarah Connor (LOVE Lena Heady), too bad it’s canceled prematurely. I think US networks just don’t give shows like this a chance, they’re itching to move on to other shows if the ratings fall even just a little bit. I can’t say I’m a fan of Brian Austin Green, but yeah I think he’s good as Derek Reese. Nice post, Jamie! I tend to dismiss actors from 90210, but Brian Austin Green was surprisingly effective as Derek Reese. I’m glad there was someone else out there that appreciated this show. At least Fox let it run for a second season. I get annoyed at that network for cancelling cool shows, but they’re about the only network that actually takes a chance on shows like this on a regular basis. I don’t know why, but I really have no interest in seeing Sarah Connor and The Planet of the apes even though I love both movies. I never heard of Alien Nation. The TV series of Planet of the Apes was very short lived and is definitely dated by today’s standards, but it’s great seeing Roddy McDowell in chimpanzee makeup again, even if it’s a different character. The show is an interesting take on the story, especially for people who are really into Apes. As for The Sarah Connor Chronicles, I highly recommend this show if you’re a fan of the movies (at least the first two). It does James Cameron’s vision justice. Also, Lena Heady really made the title character her own. I never thought I could see anyone but Linda Hamilton in the role, but Heady build upon what Hamilton did and makes her a fully-realized three-dimensional character. Thomas Dekker is good as John Connor, too, as he’s not as whiney as Edward Furlong, but is still trying to figure out his place in the world and dealing with his destiny. The “good” terminator (named Cameron) is wonderful, as portrayed by Summer Glau. The supporting cast is also quite effective, and the writers do a great job keeping the action coming yet having it make sense in the grand scheme of things. I highly suggest checking it out on DVD, Netflix (if available) or Siffee when it airs. Hmm… now you make me curious. The series was actually aired on my local tv station but I didn’t see it…only a few minutes than I changed the channel. At least give the pilot episode a try. I had my doubts about the show (though my hopes were high), but after the first episode, I was hooked. There are surprisingly a lot of movies adapted from TV shows that are good. What I may do is analyze movies that are in the same continuity as the TV show that spawned them. Yeah, but it was a good run. And SG-1 ran longer than any single Star Trek show did. I remain a fan of the ‘Stargate’ film and how fresh it was when it debuted in the movie theater. And not only did I enjoy the Sarah Connor Chronicles, it was the very fact that it did pretend “that Terminator 3: Rise of the Machines never existed.” Man, was I disappointed with the non-Cameron T3. As usual, you add some great info in regard to those other shows/films you highlight, Jamie. Thanks. I was so pleased when Stargate SG-1 decided to expand upon the movie rather than ignore it and exist in its own continuity. The film was great fun, but just scratched the surface as to possibilities. fantastic tv shows? nuh uh. fantastic movies? eh, a couple. Thanks for sharing your opinion. Which of these movies did you like? terminator, planet of the apes, alien nation. The first two are two of my favorite movies. Alien Nation showed a lot of promise that, like with Stargate, was exploited by the TV series that followed. oh wait. i got that mixed up with a different movie called “enemy mine.” also about aliens and humans getting along, but one of each. Enemy Mine featured Louis Gossett, Jr. as a pregnant alien soldier. The plot was essentially a science fiction take on John Boorman’s Hell in the Pacific. It was an early Wolfgang Peterson film, following The Neverending Story.